For most people, a visit to the dental clinic in school invokes memories of bleeding gums, horrifying drills and pliers, and psychological if not physical pain. Many would grimace at the sheer sight of the fierce and intimidating dental nurse. The way of running our business must be patient-centric; we must not forget our core value. Quite the contrary, Dr Wong is down-to-earth, amicable and straightforward. He is far from the image of a scary dentist. Dr Wong, who possesses a Bachelor of Dental Surgery (BDS) degree from National University of Singapore, as well as a Master’s degree (MSD) and a Certificate in Prosthodontics from the University of Washington, hopes to tweak the system to improve customer experience and change the way people perceive dentistry. “If you visit T32 Dental Centre, you’ll notice that there isn’t any picture of bleeding gums. We want to reduce that moment of fear to the minimum,” he says. Indeed, walking into T32 Dental Centre at Camden Medical Centre is akin to entering a posh and contemporary office. One finds one’s fear and anxiety assuaged by the sight of comfort and luxury. Dr Wong is not just a gentle dentist; he is also a keen educator. In 2005, Mr Wong established the T32 Institute for Advanced Continuing Education (ACE). It is now known as the T32 Dental Academy. “I started T32 Dental Academy as I felt that it is important to educate the public about dentistry. Basically, we educate consumers and empower them to make a well-informed choice on dental treatments. Dental services such as implantation can cost up to $5,000, which is not a small sum,” explains Dr Wong. In 2007, T32 Dental Centre was founded to extend comprehensive dental care to Singapore and the wider region. 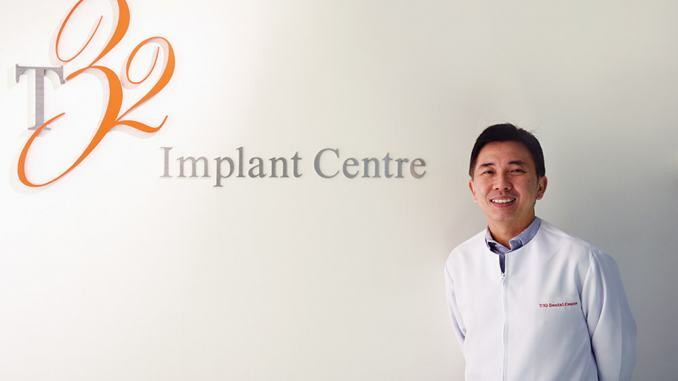 In 2013, foreseeing the demand for dental implants, Dr Wong set up T32 Implant Centre – South East Asia’s first implant centre that utilises the Eden Objet 3D Printing System and the Zirkonzahn CAD/CAM System 5-Tec for dental implant treatments. From a humble practice in Paragon with merely five staff members who only do dental implants, T32 has grown into a sophisticated team with over eighty staff. Besides the main centre at Camden Medical Centre, T32 also subsequently established five other branches across Singapore. T32 also has an overseas presence. It engages in joint-venture partnerships with acclaimed dental centres in the region, such as Branemark Osseointegration Centre in Hong Kong and many others in the Philippines and Vietnam. According to Dr Wong, having a good attitude towards patients is key to being a good dentist. The main objective must be getting patients better; if the main objective is the transaction, it becomes a problem, he says. To date, T32 in Singapore has a revenue of almost $12 million and a profit margin of around 10%, according to Dr Wong. 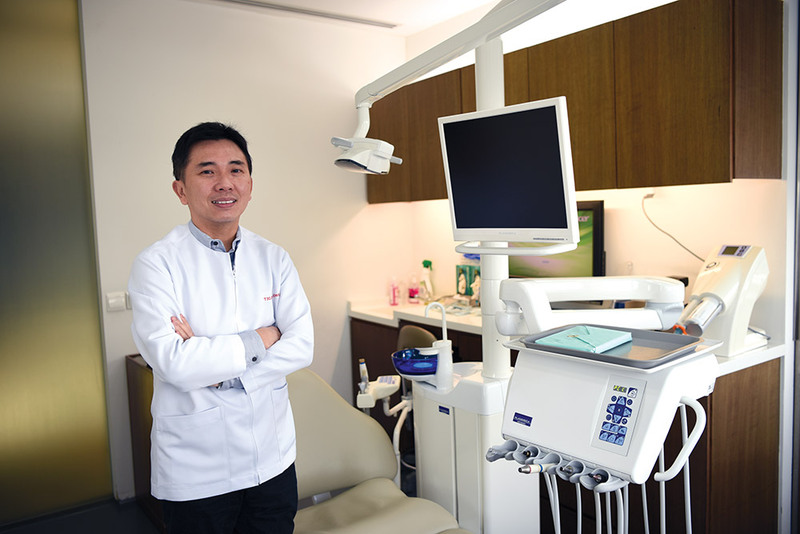 Dr Wong Keng Mun, Managing Director of T32 Dental Centre Pte Ltd. T32 Dental Centre was founded to extend comprehensive dental care to Singapore and the wider region. T stands for teeth. We have 32 teeth in an adult, thus the name – T32. We did not want the traditional way of branding, like calling it “Dr Wong Keng Mun Dental”. As [dentistry] is evolving into a lifestyle choice, I thought it was better to create a fun and creative brand. What inspired you to venture into private practice? Why did I make it into a business? I don’t know. (Laughs) It was probably due to the demand for growth. We always keep an eye on what consumers need. We find that kids need a special area for treatment, and that’s why we designed a junior area specially to cater to kids. Reckoning the necessity to change kids’ perception of dentists, we invite preschool pupils to visit our kids’ clinic, where we explain to them how they should take care of their teeth. We find that implants are important for the elderly, and we began investing in equipment for implantation. We set up branches across Singapore to reach out to consumers in different neighbourhoods. Typically, we initiate certain things because there is a purpose; we see that there is a dearth of a specific service and we provide it. We also invest to change consumer experience. If you are talking about lifestyle change, we have to be bold enough to do things differently. Honestly, I set up this business not solely for making money. I set up this business to change the way people look at dentistry. I set up this business to find ways to become better in my profession. If I want to make money, this conference room would be transformed into dental chairs. Have you aspired to be a dentist since young? No, it is interesting because I got into dentistry by chance. I did not come from a well-to-do family. My parents always told me that I had to be a lawyer or doctor when I grew up. After finishing my studies at Anglo-Chinese JC, I applied for medicine but I didn’t get in. I was given dentistry instead. I was a bit disappointed, but I took dentistry even though I didn’t even like dentists. But as I didn’t see myself becoming a lawyer or accountant, I decided to give it a try. Ironically, I enjoyed dentistry as it is so hands-on. I like to build things and I did really well for dentistry and was offered a place in the US to further my studies. Are you also practising aesthetic dentistry? I am practising aesthetic dentistry because the field I chose was restorative care – that means when I see people with a missing tooth, I will restore it with an implant. If people don’t have the best smile, I can reconstruct it. Your philosophy of dentistry, in summary, is to get patients better? Yes, our focus shall be getting patients to be better. We listen to what patients need, and we do not dictate to them what they should be doing. Therefore, I think that education is very important. If I educate my patients to make them understand what they need, they will be able to make their own choices and decide whether to opt for the treatments. Walking into T32 Dental Centre at Camden Medical Centre is akin to entering a posh and contemporary office. Can you tell us more about dental technology locally and worldwide? The US is very far ahead of us. In fact, Hong Kong is more advanced than Singapore in their so-called dental IQ. However, eating becomes problematic for denture wearers and they tend to eat soft foods. In addition, they can’t taste as dentures have a layer of plastic; that is precisely why they like to [consume] lots of soy sauce which is not good for health. In Hong Kong, it is different. Most of them prefer implants. The demand for implants is higher than in Singapore. That is why we have to change people’s perception gradually. I set up this business to change the way people look at dentistry. You are a doctor, educator, and entrepreneur. Which role do you get most satisfaction from? All. I like what I do. Whether it is entrepreneur, business person, dentist, or educator, everything about what I am doing is dentistry. I don’t invest in property, shares or go to casinos; I have no time. Everything is dentistry. You mention that patients should come first. Is your company not profit-driven? Of course, profit is important, but there must be a balance. I think every company must look into profit. But patients should come first. If I don’t look at profit, then this company will collapse. We should look into profit. Nevertheless, the way of running our business must be patient-centric; we must not forget our core value. What challenges do you face running T32? In any business, the biggest challenge is definitely the cash flow of the company. Now in Singapore, we have three challenges: cash flow, rental, and manpower. A lot of businesses will go down due to these factors if we don’t look to address them. In the first two years, I read that you were not making a profit due to investment. We constantly invest. That is why I say we look at cash flow very tightly. We look at a certain profit margin. Most of the time, we re-invest into the company. We want to invest in technology that is helpful. T32 Children’s Dentistry is a designated area at T32 Dental Centre in Camden Medical Centre that specially caters to kids. I think you have to give up something to get something. I make a point not to work on Saturdays. I spend family time on weekends as that is the only time I spend with my kids. We have to have family dinner at least once a week. One thing that is missing in most entrepreneurs’ lives [is family because they focus on career so much]. What is your parenting style? What values do you teach your kids? I have two daughters aged five and 10. As Saturday is the busiest time for the clinic, I gave up a big chunk of money not working on Saturdays, but I made the right decision as my kids are growing up. When I travelled, I would bring them along most of the time. I think it is very difficult to teach them values. They will just see how you behave. I will [be] a role model for them by being a good person. I don’t think I am successful, but I think we are doing the right thing. People said that I am successful, but I still have so [many] things to improve on. What is your vision for T32? My vision has always been to improve things. There are still a lot of things we can improve on, such as service. If you visit any healthcare centre, the biggest concern is the waiting time. For me, there must be no waiting. I am very particular about time. Everything we do in life, there is definitely a better way of doing it. I envision T32 to be an assurance of quality. My dream is that all my patients will walk into the clinics of T32 confidently, knowing that they will get the best, timely service. I want to standardise and make sure that I can maintain a certain level of service throughout all my branches. The only challenge that I have is to maintain a team of people with good attitude. We will continue to grow, and continue to get people who share our philosophy – to get things better for patients.